If you’re planning a trip to Macedonia and you’re an avid Instagrammer, Ohrid probably features high on your photo wish list. Its lake is still and pristine; its architecture is historical and beautiful. But Skopje, with its controversial Skopje 2014 facelift that often leaves it unfavorably compared to Las Vegas, often falls flat in the eyes of Instagrammers. While I don’t think Skopje is nearly as beautiful as Ohrid, it does have plenty of photogenic corners that capture its quirky side – and I do love a challenge of finding beauty in cities other people deem “ugly, “the way I did for finding Instagram spots in Tirana and in Pristina. 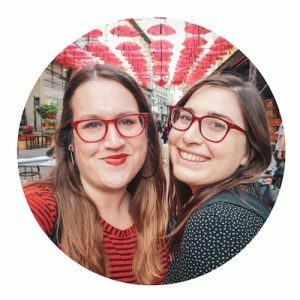 I’ve done the legwork for you in finding the photogenic corners of this city, so I hope this guide is helpful! If you find this helpful, be sure to hashtag us at #sofiaadventures so we can check out your shots and feature them on our account! Want to save this guide for later? Click to Pin and save! Much of Skopje has been renovated and rebuilt after a series of harrowing earthquakes which shook the city, the worst of which was in 1963 when a magnitude 6.1 earthquake destroyed 80% of the city. As a result, much of the city is rather new. However, luckily, the bazaar district has been rebuilt according to its historical norms. Its architecture and its vibe is old in a way that much of Skopje is not, and it makes it one of the most photogenic parts of the city as a result. One of the best views of Skopje can be found at the Skopje Fortress (Kale – hipsters, don’t get excited, that just means “castle” in Turkish). The first construction on this site dates back to the 6th century CE, and it is thought that the structure we see today was begun in the 10th and 11th centuries. The fortress isn’t in the best condition to this day, but it is still rather impressive and definitely worth a visit when in Skopje, especially timed for sunset or sunrise. Did you know Skopje has its very own Paris-style Triumphal Arch? It’s much newer than Paris’s, obviously, as construction only began in 2011 and was completed shortly thereafter. It was part of the Skopje 2014 renovations, done by the sculptor Valentina Stefanovska who also did several other sculptures for the 2014 project, including the famous “Warrior on a Horse.” It’s been a bit of a controversy in Skopje, mostly for the excessive price tag, which the citizens view as government mismanagement of funds in the face of other problems Skopje has. Much of the Skopje 2014 renovations are controversial due to their gaudiness and excessive statues. In my opinion, the bridge in front of the Archaeological Museum in Skopje represents the renovations at their finest and most restrained. While still quite obviously new, I feel the bridge was constructed very tastefully and beautifully, with attention to detail and symmetry. Even the presence of over a dozen statues doesn’t do much to take away from it! Skopje has got to be the only European capital city with a pirate ship sitting in its main river! It’s a quirky place where you can sit and have a coffee (surprisingly not too overpriced) while enjoying a view of Skopje’s riverside museums and bridges. It’s a great spot to take a few unique Skopje Instagram photos on your trip! You can also get some interesting photos of it from the bridge that leads to the archaeological museum. Skopje, you’re weird, but I kind of dig it. 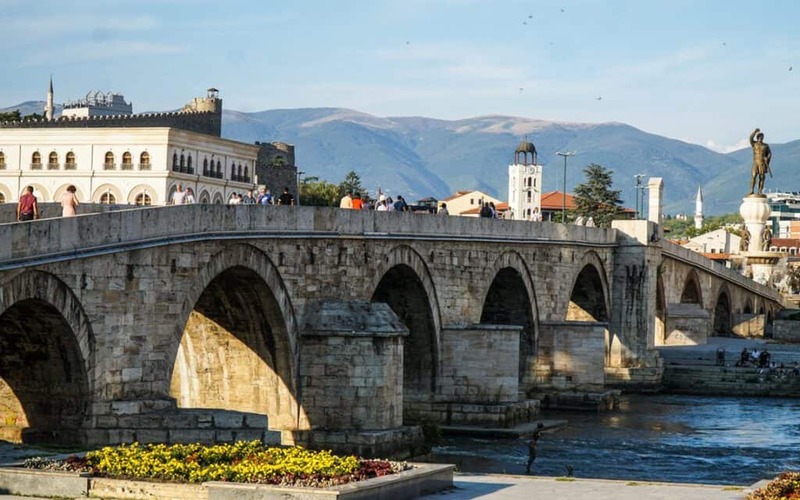 Another historical place in Skopje, the Stone Bridge dates back to the 15th century. Standing next to the newer bridges and flashy monuments of the Skopje 2014 project, it makes a unique counterpoint to the new architecture of the center. It was built sometime between 1451 and 1469, and was damaged several times: most drastically in the great earthquake of 1555, but it was always repaired promptly, hence why it’s in such good condition today. It suffered its gravest threat in 1944, when Nazi occupiers rigged it with explosives – luckily, at the last minute, the detonation was called off, and the bridge was allowed to stand as proudly as it ever has. The “Warrior on a Horse” statue is emblematic of the controversy between Greeks and Macedonians regarding the name Macedonia and several important historical figures who were from the original region of Macedonia (which is now spread across 6 countries, Greece, North Macedonia, Bulgaria, Albania, Serbia, and Kosovo). Theoretically, this statue is of Alexander the Great, but it is not officially named after him. 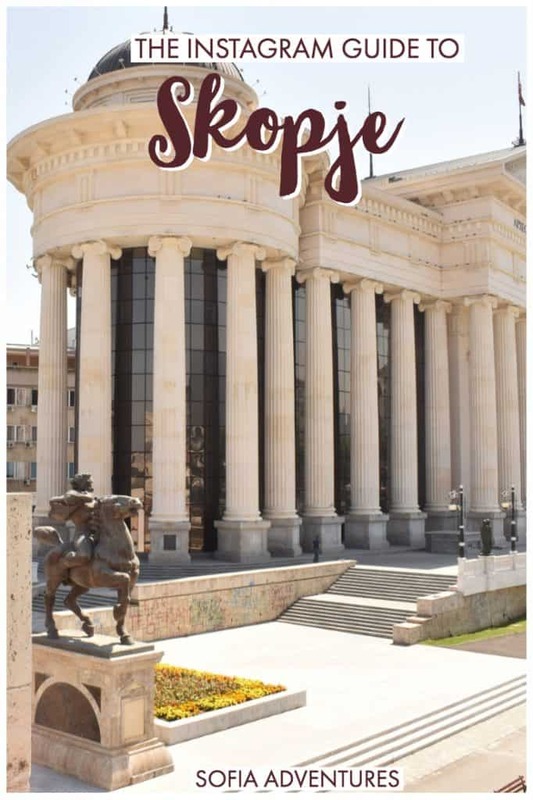 Frankly, we don’t care to debate the finer points of which country can claim the history of the so-called “Man on a Horse” – just know that it is a fixture of Skopje’s architecture and one of the city’s most recognizable symbols. How many cities can claim a mountain right in their own backyard (well, besides our adopted home city, Sofia)? Mount Vodno is extremely easy to get to from downtown Skopje, making this not so much of a day trip as just another thing to do in Skopje. You can easily take a bus and cable car combination to get up to these gorgeous views! Also at Mount Vodno, you’ll find the enormous Millennium Cross. And when I say enormous, I mean enormous, as it’s 66 meters (217 feet) tall, making it one of the tallest crosses in the world. It was built in memorial of 2,000 years of Christianity in Macedonia (though, to be honest, not sure their math is exactly right…) and in honor of biblical passages which cite St. Paul evangelizing in the historical region of Macedonia. Not technically in Skopje but truly so beautiful that we can’t leave it out, Matka Canyon is an obvious answer to the question of what are the best Instagram places in Macedonia. This is the most famous viewpoint, but you can also kayak in the canyon for a beautiful view from another angle! If you’re still undecided as to where to stay in Skopje, here are our top picks for each budget category! Budget: A brand new boutique hostel with only private rooms, at basically the same price as staying in a dorm? Sign me up! The lovely Clover Hostel right near the center of town is great for solo travelers who want a social environment with a bit of privacy, and it’s inexpensive enough that you can enjoy some peace (and nights without snoring soundtracks) without it breaking the bank. It’s located near the center as well as Skopje’s co-working spaces so if you are planning an extended stay in Skopje and need to work as well, it’s a great choice. Check out prices, availability, and reviews here. Mid-range: For an affordable option that offers way more privacy than a hostel, I stayed at and highly recommend Boutique Hotel Rose Diplomatique. The rooms were comfortable and spacious (though admittedly furnished a bit oddly – mine for some inexplicable reason had an exercise bike in the bedroom). The breakfast spread was tasty and super generous, and I loved getting to eat in the lovely patio every morning. The staff was really friendly, even when we arrived late in the evening, and generally I just felt really welcome here. It’s a short walk from the center and an even shorter walk to the trendy, leafy hipster neighborhood of Debar Maalo. One note: there is no elevator so if you have trouble with stairs this may not be the right place for you. Check prices, reviews, and availability here. Luxury: Skopje has a number of 5 star hotels, but our top pick is the Marriott for one main reason: location, location, location! Literally overlooking the famous “Warrior on a Horse” statue, this hotel in the center of town couldn’t be more central. The rooms are spacious and well-designed with flatscreen TVs and stunning TV views, the in-house hotel bar is sleek and trendy, and travelers rave about the delicious breakfast. There’s a luxurious in-house spa with an indoor pool, jacuzzi, sauna, masseuses, and a fitness center – so if you want a bit of TLC while in Skopje, you don’t even have to leave your hotel’s front door. If you want to stay in the most luxe hotel in Skopje – and not pay an arm and a leg for a 5 star hotel – this is certainly it. Check prices, reviews, and availability here. Planning a Trip to Macedonia? Don’t Forget Travel Insurance! 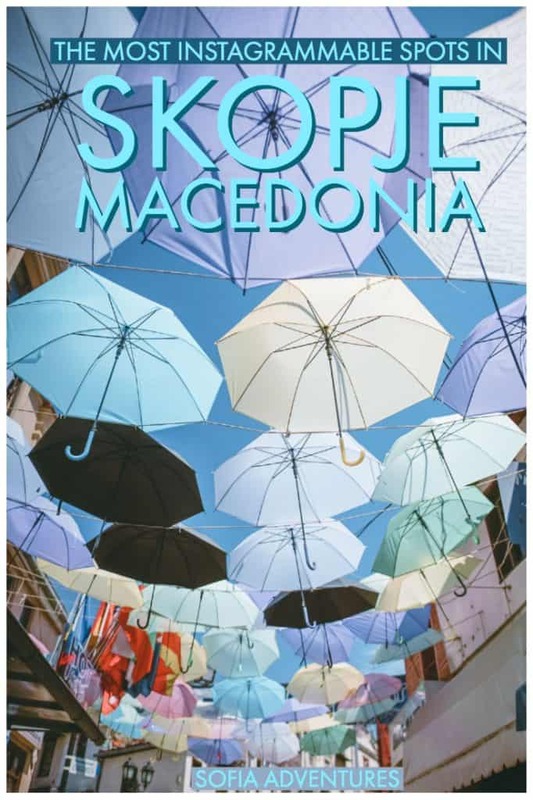 Make sure you always travel to Macedonia with a valid travel insurance policy. While the country is safe, accidents can happen anywhere. If you experience an accident or theft, travel insurance will help you recover your costs and enjoy the rest of your trip.